It sounds like the set-up to a bad joke: What do you get when you cross a trash panda with a mean, green gladiator? As it turns out, you get one of the most exciting aspects of Avengers: Infinity War. That’s right, Rocket Raccoon is teaming up with Hulk next year – and I couldn’t be more excited. Oh god. This opens up so many possibilities. Not only will grumpy teenage Groot have something to say (I’m guessing it’ll be ‘I am Groot’) about it – imagine if he acts like a spoilt child getting a new stepdad! – it also bodes well for a few more Avengers crossovers. Without getting into Thor: Ragnarok spoiler territory (other than it’s very good and, if you haven’t already, you should watch it), if the Guardians are meeting Hulk, you can bet that Thor won’t be far behind. I now just need every Stan Lee cameo to crossover with itself then my life will be complete. 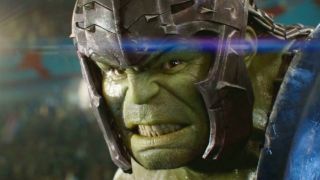 Ruffalo also mentions that “All of the universes coming together is just a sight gag within itself,” so if we don’t get a Hulk smash/Rocket on shoulder firing wildly shot then I’m going to be sorely disappointed.